When it comes to organizing wedding ceremonies, wedding planners have a host of options at their disposal, and experience as a whole leaves plenty of room for creativity. When it comes to the send off, there are several options to choose from: the New Orleans style exit, changing into traveling clothes, the colored smoke bomb exit, the decorated car, and several more. These days, however, most wedding send offs typically fall under two categories: the traditional toss or the sparklers. Both certainly have their own appeal; however, wedding sparklers have taken the lead in terms of popularity, and it’s easy to see why. Here are a few reasons why you should opt for a wedding sparkler exit over a toss exit. Toss exits have traditionally been used for several hundred years, dating as far back as the Roman era. The ancient Romans used to toss rice at the bride and groom, in order to symbolically shower them with fertility and abundance. Conversely, other items have been tossed at the bride and groom upon their exit, including wheat in France which symbolizes bounty, or candy and sugared nuts in Italy which represent prolonged sweetness in a marriage. While the metaphorical significance of wedding tosses can certainly be appreciated, the use of sparklers is much more modern, and its effect is highly practical compared to that of traditional tosses. A wedding ceremony is an inherently magical experience for the bride and groom as well as everyone invited to the event, and that sense of magic is accentuated by the proper use of wedding sparklers during a send off. The vibrant, sporadic light of the sparklers give a dancing, glowing quality to the experience. With the sheer variety of wedding sparklers available online, it’s easy for wedding planners to achieve a customized effect. The bride and groom deserve the most memorable wedding night possible, which is the main reason why wedding planners should opt for sparklers over tosses. When used during a send off, sparklers are possibly even more beautiful in retrospect than during the actual moment, particularly considering the dazzling variety of available wedding sparklers online. 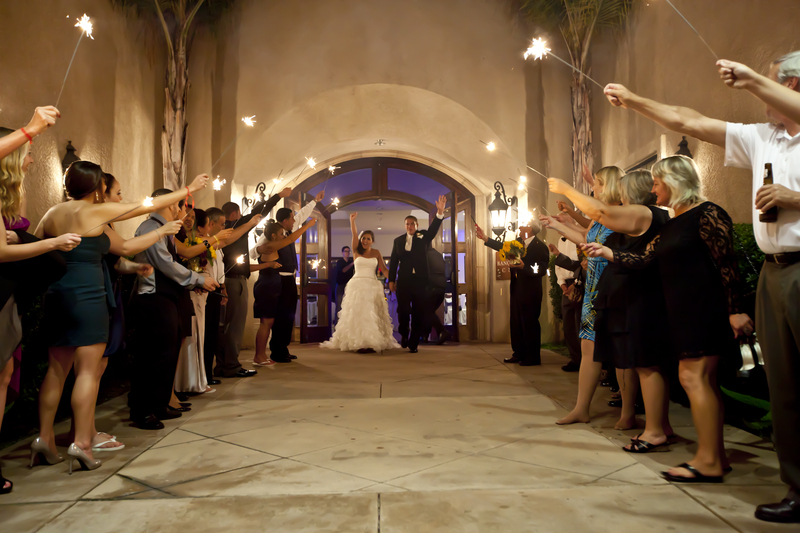 Having an exit photo gorgeously lit up by a path of sparklers held by friends and loved ones makes for a wonderful memory, one that can be enjoyed for the years and years following the ceremony. Ultimately, the wedding send off is the bride and groom’s choice. Those who prefer to respect tradition over aesthetic appeal will certainly opt for a classic toss during their exit. However, those who want their night to be highlighted up by vivid beauty can do no wrong in choosing to light up their send off with vibrant wedding sparklers. Dancing light is much more fun than wheat or rice, after all.